Branch Retinal Vein Occlusion - Associated Retinal Consultants P.C. Retinal vein occlusions are small “strokes” in the retina caused by blockages in the veins draining the retinal circulation. There are two types: central retinal vein occlusions (CRVO) and branch retinal vein occlusions (BRVO) depending on larger or smaller vessels in the retina. In many cases, the cause is from hardening of the arteries, which run adjacent to the veins and compress them akin to stepping on a garden hose. This blocks blood drainage from the retina and can cause ischemia (lack of blood flow) hemorrhages and fluid leakage (macular edema) in the retina which can be visually debilitating. 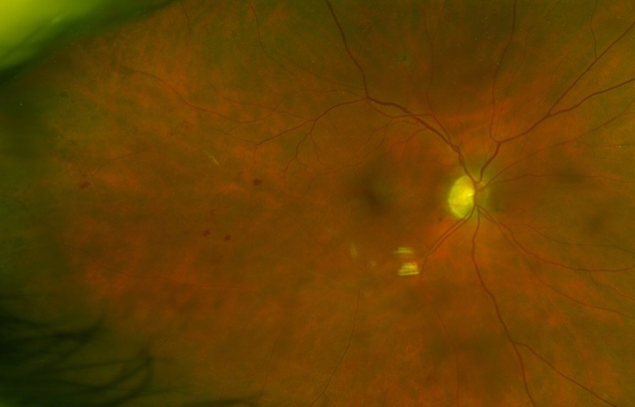 Fundus photo of a branch retinal vein occlusion. Note intraretinal hemorrhages temporally and ghost vessels at the temporal inferior arcade. 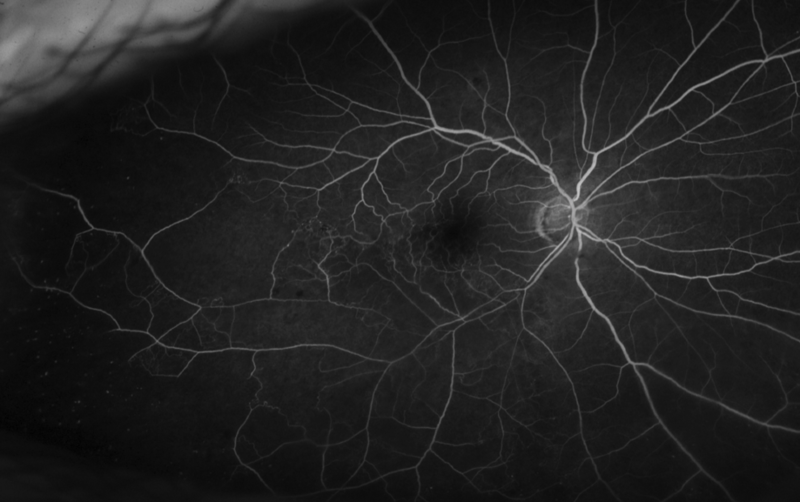 Fluorescein angiogram image of a branch retinal vein occlusion, note the mild perivascular leakage and infero/temporal capillary drop out with non perfusion. Patients may have risk factors including uncontrolled high blood pressure, obesity, heart disease, or glaucoma. Some younger patients may have blood clotting disorders. Patients with retinal vein occlusions often have retinal hemorrhages in the location of the occlusion. The blood vessels are often twisted and dilated. There may be cotton-wool spots (small retinal infarctions) which can be a sign of ischemia (lack of blood supply to an area of the retina). There can also be macular edema, or swelling in the retina. If retinal vein occlusion is suspected, your doctor may obtain an optical coherence tomography (OCT) scan to help delineate the anatomy and the location of fluid in the retina. Fluorescein angiography (FA) is also commonly obtained. FA involves injecting a dye into a vein and taking pictures of the retinal blood vessels as the dye passes through over several minutes. It can help demonstrate congestion of the venous flow, swelling in the retina, ischemia, or if abnormal new blood vessels (neovascularization) is present. FA can be useful in ruling out other potential disease states, and confirming a pattern that is consistent with RVO. Patients may be referred to their Primary Care Provider to assess blood pressure, and possible blood draw to check the blood cholesterol levels. Certain patients may also need to be evaluated with blood work to assess for blood clotting disorders on a case by case basis. Treatment is focused on relieving complications secondary to the venous blockage. Anti-VEGF medicines can be given during a short office procedure. These medicines have been shown to decrease leakage from the damaged blood vessels and help prevent growth of new abnormal blood vessels. The three drugs in this class are bevacizumb (Avastin), ranibizumab (Lucentis), and aflibercept (Eylea). Dosing schedules are individualized to the patient, and can be variable. Intraocular injections of steroids have also shown to be effective in treating the swelling related to retinal vein occlusions. Steroids have a different side effect profile, including the potential for increased intraocular pressure which can lead to glaucoma and potential for increased cataract progression. These side effects are often treatable. Laser treatments to the retina are commonly used in hard to treat cases or patients with severe disease as an adjunctive therapy. Light laser pulses are applied to the diseased areas of the retina. Treatment with intravitreal injections for vision loss related to macular edema is the most commonly recommended treatment for patients with visually debilitating retinal vein occlusions. Laser is also commonly used in certain situations. Your doctor will discuss the best treatment options for you.